by Tim Darling (email) - May, 2008. My wife and I visited Frank Lloyd Wright’s Fallingwater in May, 2008. The visitor center pavilion at the site struck me: it was an architectural statement of its own, showcasing many of the same qualities that the Fallingwater house was known for. After looking into its creator, though the details available are scarce, the story of a life-long friendship began to unfold. Born in La Linea de la Concepción, Spain in 1918, Mayén earned a Bachelor’s of Fine Arts from Cooper Union Art School in New York City and a Master’s degree from Columbia during WWII. He taught classes in advertising design at Cooper Union and New School in New York. In the early 1950s, he met a fellow art student, Edgar Kaufmann, Jr., with whom he would share his life until Edgar’s death in 1989. Edgar’s father was the founder of Kaufmann’s department store in Pittsburgh; it was his father who commissioned Wright to build the now-famous vacation house for his friends and family near a waterfall in rural Pennsylvania. Wright, exceeding the original budget by almost a factor of ten, instead designed and built Fallingwater over the waterfall. In 1955, Edgar inherited the property and Paul and he visited the site together on mountain retreats until the property was entrusted to a conservation in 1963. Edgar’s mother died of an overdose at Fallingwater in 1952; she is rumored to have commited suicide over her husband’s many mistresses. 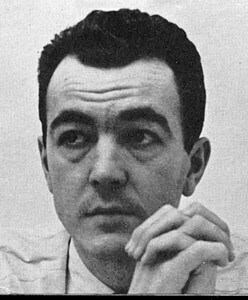 During the late 1940s and early 1950s, Edgar worked in the Industrial Design Department at the Museum of Modern Art where many of Paul’s lamps, tables, and other furniture remain on permanent exhibit. Another of Paul’s pieces, a red cubical sculpture, is on display on the coffee table in Fallingwater’s living room. In 1956, the couple assisted I.N. and Bernadine Hagan in choosing the furniture for the Hagan’s Frank Lloyd Wright house at the architect’s suggestion. In 1959, Paul designed the jacket of a book about Wright, Drawings for a Living Architecture, which was edited by Giuseppe Samonà. In 1970, shortly after the first Earth Day, Mayén became an outspoken critic of the growing American habit of buying expendable plastic furniture that was used for only a few years and then thrown away. He claimed that the economic success of plastic furniture relied on the producers creating a mentality among consumers that the items were durable enough to last but cheap enough to replace. In 1975, he built a country house for them in Garrison, New York. 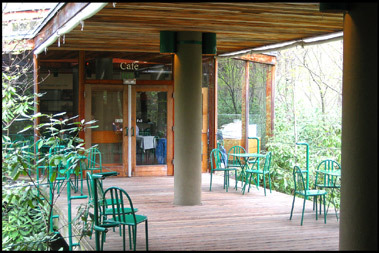 From 1979 to 1981, he oversaw the building of the Fallingwater pavilion which houses a café, gift store, and visitor’s center. 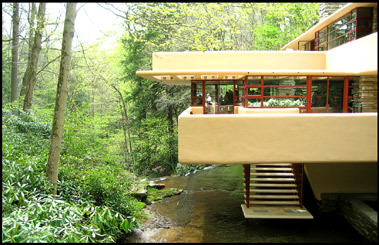 When Edgar Jr. died, Paul scattered his ashes at Fallingwater. He died in 2000 and also had his ashes scattered there. Frank Lloyd Wright designed one of the world’s most revered architectural landmarks, Fallingwater, when he was 68 years old. It revitalized his career. Over the next 24 years, he sketched and built over a hundred other buildings. Most of these new creations exhibited the same elements of style as Fallingwater. Everyone, it seemed, wanted their own “house over the river”. Paul Mayén designed one of the world’s most revered gift stores when he was 61 years old. But despite many presumed subsequent offers, he never built another. Architectural Digest Magazine. September 2002. Vol. 59, No. 9. Meikle, Jeffrey L., American Plastic: A Cultural History. Rutger’s University Press. 1995. ISBN: 0813522358. pp 230-231. Who’s Who in American Art, Marquis. 2008. In the midst of my 2nd reading of FALLINGWATER RISING (Toker), Mayan was on list of people to investigate. With 2 visits to Fallingwater under my belt, I didn't realize the architect behind the visitors center was Mayan. I agree the center is a comfortable fit within the forest at Bear Run. Also, I had no idea that Mayan was a Spaniard. Gracias! Look at his DOB, I'll need to read more as he would have been 18 at the outbreak of the Guerra Civil in Espana. So much to learn ... thanks again! I'm honored to say I worked for Paul Mayen as an assistant graphic designer in the late '0's. I wonderr if Adele Kamen is still alive, who was his partner at Hbbitat. I worked at Habitat from 1982 to 89 as Product Development Director under Paul mayen, he ws aa great man and great Designer... He is missed!!!!!! I have just seen Falling Water with my own eyes. A boyhood dream now realized. We all know how magnificent that structure is, but not all of us know how great the welcome center is. Being a carpenter, building intricate houses for years, I caan see the structure under the skin. The welcome center at Falling Waer is a work of art in itself. Subtle and simple as to not take away from the magnificence of the main attraction. A wonderful design to bring the outside indoors, compliimenting Frank Loyd Wright's masterful way he was able to do so wih the main attention without taking away from it. Most people don't see in their minds eye how many cantilevers and how intricate the structure is to make the welcome center float over the ground it so delicately does. My hat's off to the archhitect that designed it. That would have been a fun one to build.. I worked for Habitat from 1962 to 1970, my first job, I worked for Paul Mayen & Len Eisen. I was in the accounting dept. with Irv Ross. Wesstarted on Third Avenue around 25th Street and moved a few years later to East 62nd Street. I also worked wih Joni Mandeel (Dell) Joyce Romanelli, Lee Haneman, Bob Eng thee were seveeral other wonderful people whose names escape me no but I had tthe most wonderful years there. Is there anyone ou there who rremembrss ee? My wife, sister in law and myself visited Fallingwater today and had a great time. The houses and visitor center were wonderful. I would recommend the visit to everyone able. We are lucky to live withn driving distance and will someday hopefully be able to go there agaain with my grown children, they would appreciate it..
All text and images copyright © 2008 Tim Darling.